(CNS): Police have confirmed that the body a 70-year-old man has been recovered after the wreckage of a small boat was washed up in West Bay. Police said that shortly after 3.20 this afternoon, Saturday 20 March, they were informed that wreckage from a small fishing boat had been washed up on the shore close to Sand Hole Road, WestBay. Police immediately launched a sea and air search involving the RCIPS Marine Unit and Rescue One. A short time later the body of a man was located by Rescue One, approximately 150 yards from where the wreckage had been found. Local divers and snorkelers assisted police to bring the body back to shore. It is believed that the man, who was from the West Bay area, went out fishing alone around 6.00 am this morning. Police said that enquiries into the incident are ongoing. (CNS): The president of the Cayman Islands Chamber of Commerce has called on the government to implement the recommendations of the Miller Commission report and not to pick and choose for the sake of popularity. Stuart Bostock said that his organisation would do whatever it could to help government transition civil servants from the public to the private sector but the Chamber endorsed the majority of the report. The Chamber boss said that while the country was going through challenging times there was an opportunity to make progress if the community worked together and he called for an end to rhetoric and divisions. Speaking at the Chamber of Commerce Career and Training Expo, Bostock said that the Chamber endorsed the Miller/Shaw Report but was keen to see government take action on the recommendations. While the answer to the situation might be simple and obvious, Bostock warned that the solution was extremely challenging and certainly not popular due to its far reaching impact. He added that the forecast modelling contained in the report was significant, pointing to one course of action. “Austere cuts will be made and it is likely that some of our family members, friends and colleagues will be let go from the civil service in a move to reduce government expenditure,” the Chamber boss told a small audience. He noted that the private sector has already gone through its own cuts, reforms and transitions which the civil service had not had to face. Promising to help government transition staff between public service and the private sector, Bostock said the Chamber members were not magicians but could offer practical assistance in professional and developmental training. He noted the importance of education and training during the period of change but that it could also help attract new investment. These are trying times for us all but the Chamber continues to champion the benefits of education, training, and career advancement; and this has never been more important than it is today… An educated workforce is a powerful lure to investing companies who may not be hiring today but are basing decisions on the future and looking for the right person tomorrow,” Bostock added. He welcomed the reform within the Employment Relations Department and in particular the new initiatives, including the National Employment Passport Scheme. “The Chamber fully endorses this programme and its goal of improving employment prospects and opportunities for our youth through education, training and job placement support. We are pleased to have been listed as a training resource and look forward to sharing in this common objective,” Bostock said. He asked people to stop the local vs. foreign banter which he said had infected the country and public forums which are communicated all over the world. “Integration has played one of the most important parts of this country’s history, perhaps even more so in recent decades, and one thing is certain, it is critical to the success of our future. As a born Caymanian and a businessman across many industries, trust me when I say that Caymanians and expatriate workers of all levels are interconnected and reliant on one another. I say with conviction, we cannot have the success of one without the other,” Bostock said. (CNS): The long awaited direct flight from Miami to Cayman Brac starts next month, Cayman Airways Limited (CAL) has announced. The Saturday 75-minute flight will leave Miami at 12:30 local time and arrive on the Brac 12:45 local time. 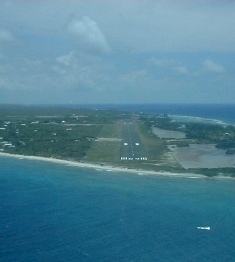 MLA Moses Kirkconnell, who is also president of the Sister Islands Tourism Association (SITA), said that this flight had been identified by SITA as critical to the rebuilding of the Brac tourism product, and members could now move forward in creating packages around this flight to penetrate the US market. The airline said on Friday evening that from 17 April there will be a weekly non-stop flight from Miami to the Brac. The Roundtrip fares start at CI$292.60 (US$348.35) with taxes and fees included. The nonstop Saturday flights to the Brac depart Miami at 12:30pm (Eastern Daylight Time) as flight KX103, and arrive on Cayman Brac at 12:45pm (Eastern Standard Time). Passengers have two options for travelling to Miami: on flight KX102 departing the Brac at 6:10am and arriving in Miami at 9:50am on Mondays, Fridays, Saturdays and Sundays, with one stop on Grand Cayman; or flight KX103 departing the Brac at 1:25pm and connecting with flight KX108 at 2:55pm which arrives in Miami at 5:15pm on Saturdays. While direct flights have been scheduled to the Brac before, the complaints have been that they left Miami too early for passengers on connecting flight to take advantage of them. This mid-morning flight will not only allow greater flexibility for passengers flying straight to the Brac, which would cut down on their travel time considerably, but visitors going on to Little Cayman can change on the Brac for the short hop to that island on the CAL Express Twin Otter aircraft..
Kirkconnell noted that the Sister Islands now has more rooms available than before Hurricane Paloma hit the island in November 2008. With the opening of the Alexander Hotel, the recent reopening of the Brac Reef, the imminent reopening of Brac Caribbean and Carib Sands condominiums, as well as the completion of phase 3 of Carib Sands, plus Breakers condos and a number of guest cottages, there will be approximately 200 rooms on the Brac. There are also 143 rooms on Little Cayman, he said. Acting CEO for Cayman Airways Fabian Whorms said he was delighted CAL had helped make this dream come true. “As the national flag carrier of the Cayman Islands we are proud to have assisted with making this dream a reality for our Sister Islands, and we look forward to continuing to work with tourism and other stakeholders on Cayman Brac and Little Cayman in their goal to revive and regenerate their tourism product,” Whorms stated. Nonstop flights to Cayman Brac from Miami are now available for purchase through www.caymanairways.com or by calling: Cayman Airways reservations 949-2311 on Grand Cayman; 948-1221 on Cayman Brac; or a travel agent.